Remove the ap sensor. Refer to “ap sensor removal and installation” . 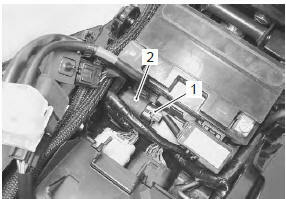 Disconnect the coupler (1) and remove the to sensor (2). Install the to sensor in the reverse order of removal. when installing the to sensor, bring the “up” letters “a” upward. Refer to “dtc “c29” (p1654-h/l): secondary throttle position sensor (stps) circuit malfunction” in section 1a .